Posted 8:04 pm by Administrator & filed under News. 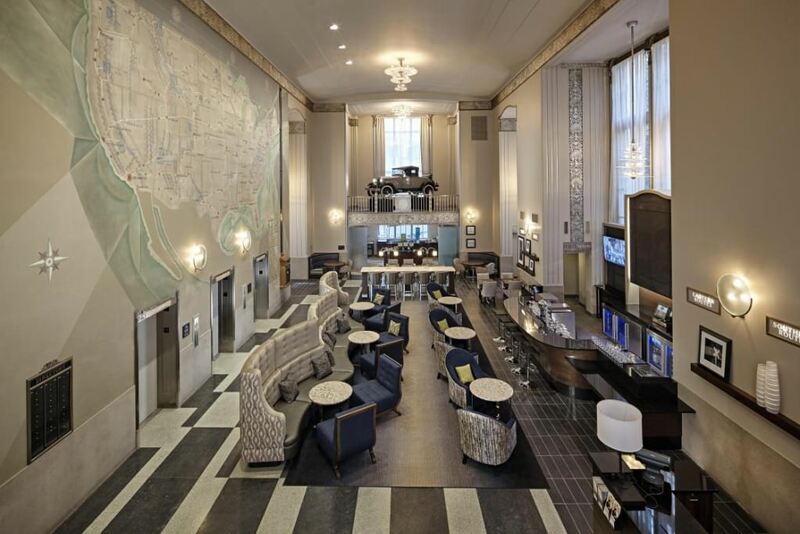 Following a two-year long renovation, the historic Chicago Motor Club building has reopened as the Hampton Inn Chicago Downtown. The property, which is a Chicago Landmark and listed on the National Register of Historic Places, celebrated its grand opening on July 10, 2015. Long considered one of the city’s finest Art Deco skyscrapers, the 17-story Holabird and Root building was designed for the Chicago Motor Club, a renowned organization formed in 1906 to promote the automobile, safe roads and the exchange of travel information. It served as the original American Automobile Association (AAA) affiliate’s headquarters from its grand opening in 1929 until 1985 when AAA-Chicago Motor Club relocated to Aurora, IL. Retained by Walsh Construction to oversee the architectural design of the building’s conversion from office use into a Hampton Inn, and working in collaboration with interior design firm The Gettys Group, HPA preserved the remaining historic elements of the building. The restored limestone, terra cotta, and cast iron façade enlivens the building from the street and draw guests into the historic barrel-vaulted lobby. The 33-foot tall lobby includes a 67-seat cocktail bar and two balconies on the mezzanine level, one featuring a 1928 Ford Model A on display. Accentuating the west wall of the lobby is a fully restored, 29-foot John Warner Norton mural of popular road destinations across the country, allowing hotel guests a glimpse at the buildings past as a road map and travel advice destination. In recognition of the exemplary work, the Chicago Art Deco Society awarded the project team its first-ever Joseph Loundy Preservation Award. Visit the Commercial Projects page to view HPA’s full Hospitality Portfolio.